Paris, France. 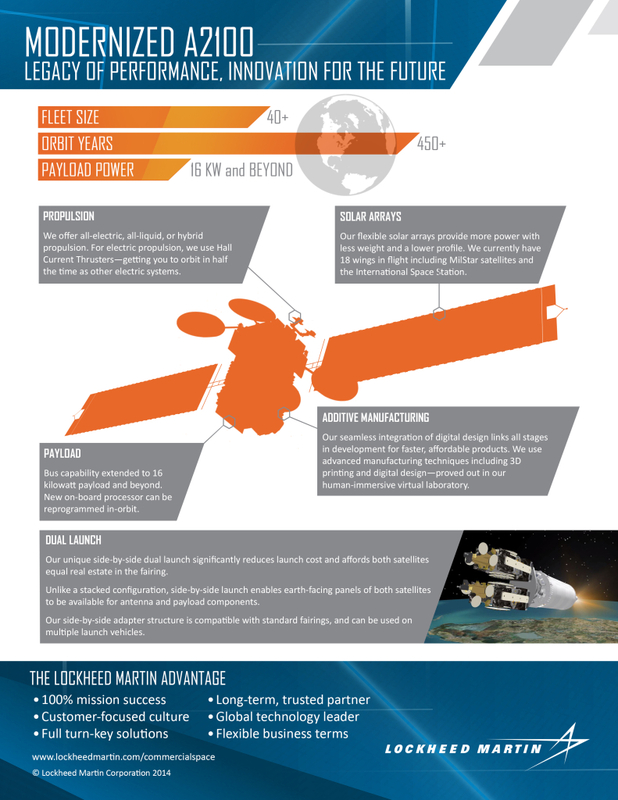 September 8, 2014 – Lockheed Martin today announced two major upgrades to the A2100 family of satellites that provide broadband, mobile and military communications, as well as GPS services to millions of people around the globe. With more than 40 satellites currently flying, the Lockheed Martin A2100 is undergoing a modernization to reduce cost and speed delivery timelines – all while improving capability for customers. Two A2100 satellites can now be launched to orbit aboard a single rocket using a unique side-by-side dual configuration that cuts launch costs without sacrificing payload capability. In addition, customers will be able to modify the A2100’s mission payload over its lifetime, thanks to a new processor that can be reprogrammed in orbit. “Our A2100 side-by-side dual launch will give each satellite equal configuration flexibility, while reducing overall launch mass and cost – these features bring new options, flexibility and customer benefits to the most reliable satellite platform on the market today,” said Mike Hamel, vice president and general manager of Commercial Space at Lockheed Martin. Side-by-side launch is the only dual configuration that accommodates large earth-facing antennas aboard each satellite. The approach is enabled by flexible solar arrays that save mass and cost while enabling a narrower satellite. The fully reprogrammable mission processor allows users to modify payload configurations and performance in-orbit, adjust satellite-to-ground communication, and suppress interference. Today, satellites typically amplify incoming signals and route them back to earth. With reprogrammable technology, signals can be processed and routed to different users and locations. For example, if a thousand mobile calls came into a single satellite, the on-board processor can switch those calls to discrete users and locations. The modernized A2100 also offers flexible electrical power, multiple propulsion options including electric, chemical and hybrid systems, and a range of advanced payload capabilities. The A2100 is tailored and produced using Lockheed Martin’s “digital tapestry,” a virtual production process that includes additive manufacturing and is aimed at speeding and streamlining design, production, final assembly and test. The Lockheed Martin A2100 fleet has accumulated more than 450 years of operation. In addition to the commercial market, the A2100 also serves as the common platform for multiple government satellites including the Advanced Extremely High Frequency, Mobile User Objective System, Geostationary Operational Environmental Satellite Series-R and GPS III.